caravans, boats and in the home. Prewash: Remove excess soil and wet the stain with water. Apply stain bar to both sides of the fabric. Wash as directed on the label. 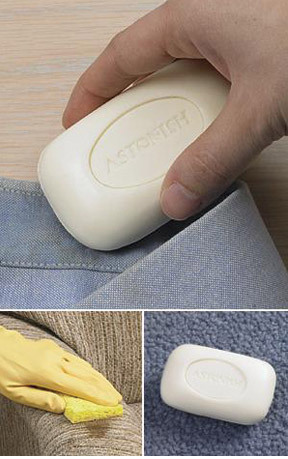 Clothing accidents: Remove excess soil and dampen stain with water. Apply stain bar to both sides of fabric. Rinse well and dry with cloth or towel. Carpets & upholstery: Remove excess soil and dampen stain with water. Apply stain bar with a damp cloth or sponge and rub gently into the stain. Note: Check for colour fastness on a small inconspicuous area before use. with plenty of water. If swallowed seek medical advice and show this container or label.